1. Start with getting your pet acclimated for the area you plan on giving the bath in. 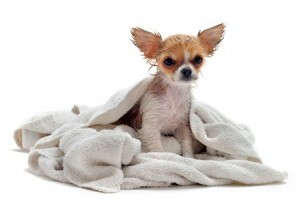 With small dogs this doesn’t always mean it has to be a bath tub, you can used a basin or even a large sink. Do this by placing them in it without starting bath time and giving them treats, they will know this is an ok place to be and feel comfortable with it. 2. Prepare your supplies and gather things you will need. Be sure to be ready with your shampoo and grooming tools and also a towel to help dry them off when done. 3. Groom your dog before starting the bath, such as brushing their fur. This will loosen all dirt and also take care of any mats your dog may have. 4. Start the water and make sure it s is an appropriate temperature, not too hot and not too cold. 5. Lather up your pup and rinse them off. Make sure to be thorough! 6. Help your dog out of the tub and dry them off fully. It is important to get them as dry as possible, because for small dogs, they get cold easy and you don’t want them to be uncomfortable. Here is a small dog who LOVES his bath!